Whitby Mercantile Hockey Team, C. 1957. Back Row: , Philip Waltham, Kenneth Arnold, , , , Kenneth . Front Row: Andrew Goode, Norman Snelgrove, , Wayne Thomas, . 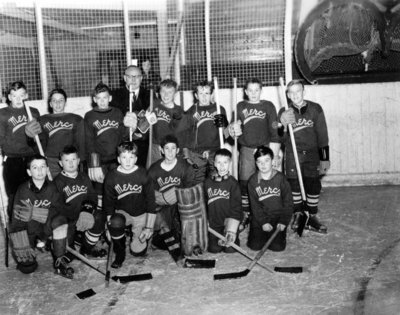 Whitby Mercantile Hockey Team, C. 1957, Photographer Unknown, Whitby Archives 21-005-054.